Changing Your Reality Is Key To Changing Your Life. Your Life Is Made Up Of Continually Changing Realities Which Are Created By You. Your Reality Is The Result Of What You Think And How You Feel. Your Emotions Are Determined By Your Mood. So When You Can Control Your Mood, You Can Create A Reality You Love.Although It May Seem Simple, Your Mood Is A Determining Factor In Molding A Life That Is Fil… led With The Things You Love. Controlling Your Mood And Not Controlling It, Makes The Difference In The Direction Of The Path Of Your Life. When You Know How To Feel Happy, Your Reality Creates Happiness In Your Life And Your Life Flows Beautifully.No Matter What Your Circumstances, Happiness Is A Learned Behavior And It Gives You The Ability To Thrive In Any Situation. It Doesnt Mean You Will Be Happy All The Time, But It Does Mean That You Will Know How To Get Back To Being Happy When You Arent. Therefore, Your Low Times Will Be Less And Your Up Times Will Become The Normal.Change Is Never A Giant Leap, But A Series Of Small Steps In The Direction Of Your Dreams. 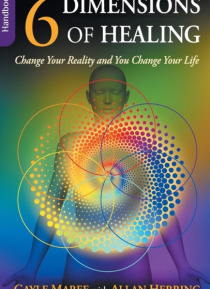 6 Dimensions Of Healing Is The Guide Book To Living A Life You Love.